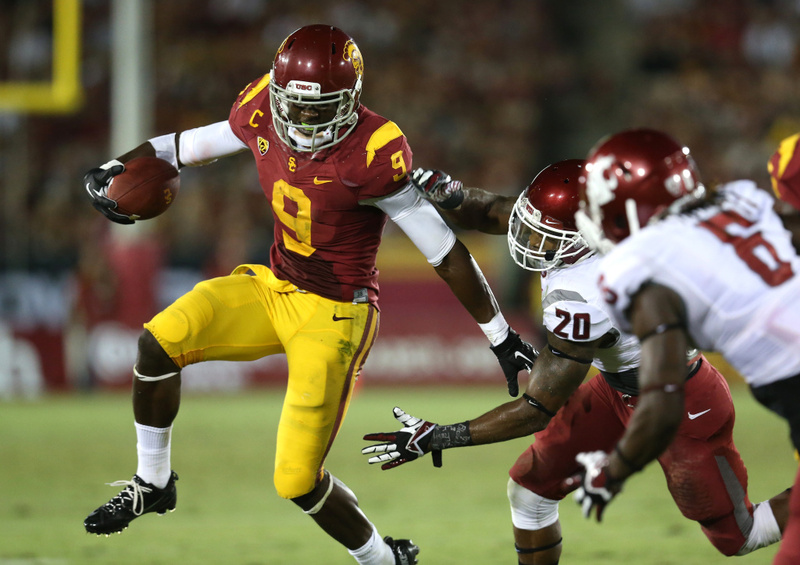 Wide receiver Marqise Lee #9 of the USC Trojans carries the ball against safety Deone Bucannon #20 of the Washington State Cougars at Los Angeles Coliseum on September 7, 2013 in Los Angeles, California. The Cougars won 10-7. From possibly paying college athletes out in the open to paying them under the table and actually much worse, it's now time for a look at sports with Andy and Brian Kamentzky, who have covered sports for ESPN and the L.A. Times. As we just heard, some are making the argument that college athletes, specifically ones for the big revenue generators football and basketball, should be paid. But a story out this week in Sports Illustrated reports that Oklahoma State University may have taken that to very seedy level. If all this is winds up to be true, what does the NCAA do? Who do you punish? How do you punish for something that happened years ago? Locally, USC football is having some issues from who their quarterback is to how head coach Lane Kiffin is handling himself. What's going on at Heritage Hall? Since a Los Angeles football discussion always focuses on how the city is NFL free I'm going to squeeze in one more story. A local football team is looking to bring create an unholy alliance of sorts. The Lakers are always the one of the drama-rich teams in all of sports. Now the drama may become scripted. A little over three years ago, Lebron James had a nationally broadcast special where he announced his decision to leave the Cleveland Cavaliers and take his talents to Miami. It's worked out well — two titles — but soon he has another decision to make. Barry Bonds holds the single season home run record with with 73 although some feel it's tainted. But in Japan, their home run record is sacred and in danger. Sunday in Seattle is one of the juiciest NFL match-ups so far as the San Francisco 49ers take on the Seahawks. These are two of the best teams in the league and there could be a lot more at stake than just the game.